M T D N o v e m b e r 2 0 1 8 14 N e w s / V i e w s Jack Williams Tire adds a third store in Lancaster J a c k Wi l l i a m s Tire Co. Inc. has opened its third store in Lancaster, Pa., relo cating a store the company acquired three years ago from Lebzelter's Total Car Care. Jack Williams h a s m o v e d t h e former Lebzelter's store in Millersville 3 miles to a new d e v e l o pm e nt i n Lancaster. "We are excited about the upgrade in store and our relocation to the new Lime Spring Square development," says Jason Wil- liams, executive vice president of Jack Williams Tire. Greg Diritto, who has been with Jack Williams Tire for eight years, will continue as general manager of the location. e new store features a modern and customer-focused design, which includes a child-friendly spacious waiting area, free Wi-Fi, an internet bar and free shuttle service. The location offers tires and custom wheels and performs auto service and repairs, including state inspection, brakes, wheel alignments, oil changes and maintenance. e store opens as the company looks ahead to its 90th year in business in 2019. Jack Williams Sr. established the dealership in Kingston, Pa., in 1929 with a $500 loan from his father. e company is in its third generation of operation and has grown into a network of 36 retail locations and 12 warehouses throughout northeastern and central Pennsylvania. In 2006 Bill Williams was named Mod- ern Tire Dealer's Tire Dealer of the Year. His three children, Scott, Jason and Tracey, now lead the business. Bill Williams, center, gets ready to cut the ribbon on the com- pany's 36th store. The company was founded in 1929. USTMA has a new leader Goodyear Tire & Rubber Co.'s Steve Mc- Clellan will serve a two-year term as chair- man of the board of directors for the U.S. Tire Manufacturers Association (USTMA). McClellan, president of the Americas at Goodyear, succeeds Jim Hawk, chairman of Toyo Holdings of America Inc. ZC Rubber hosts dealers Zhongce Rubber Group Co. Ltd. (ZC Rubber) hosted more than 250 tire dealers during its 2018 dealer conference in the Philippines. Camso celebrates Iowa plant Camso Inc. held a community open house on Oct. 4, 2018, to mark the opening of its 240,000-square-foot plant in Peosta, Iowa. The new plant, which began operating a year ago, replaces a smaller location in Peosta. Network expands in Mexico The Automotive Distribution Network added its 10th Parts Plus Mexico member with the signing of Racing Autopartes based in Piedras Negras, Coahuila. Cooper may close factory Cooper Tire & Rubber Co. may shut down its light vehicle tire production in Melk- sham, Wiltshire, England. The company will spend the next 10 months studying its options. Border Tire buys TCi assets Border Tire LLC is buying five Tire Centers LLC (TCi) stores and one TCi retread plant from Michelin North America Inc. All loca- tions are in California. The deal is expected to close Nov. 30, 2018. 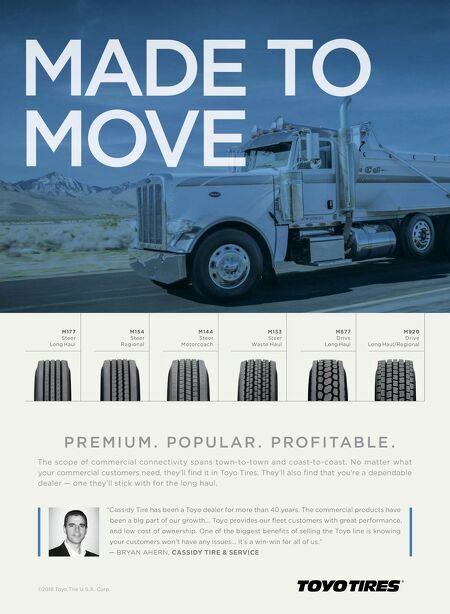 Border Tire operates five commercial locations and a retread plant in Texas, New Mexico and Arizona. 50 winners 'Race to Charlotte' Fifty grand prize winners of the Race to Charlotte Sweepstakes sponsored by Auto Value and Bumper to Bumper stores enjoyed a weekend at the Bank of America Roval 400 at Charlotte Motor Speedway. ALI strengthens standard The Automotive Lift Institute (ALI) has expanded the third-party testing required for a vehicle lift to earn its gold certification label. 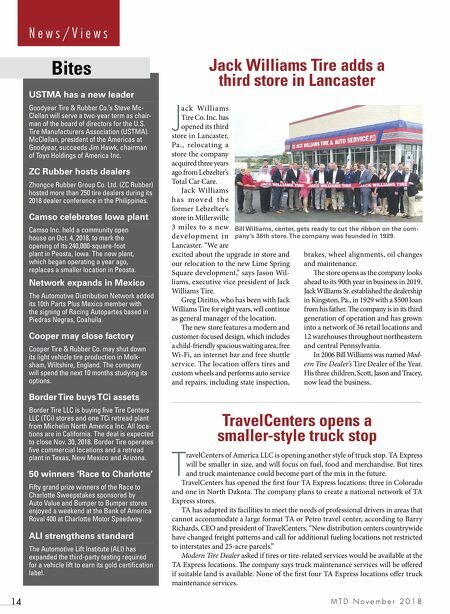 Bites TravelCenters opens a smaller-style truck stop T ravelCenters of America LLC is opening another style of truck stop. TA Express will be smaller in size, and will focus on fuel, food and merchandise. But tires and truck maintenance could become part of the mix in the future. TravelCenters has opened the first four TA Express locations: three in Colorado and one in North Dakota. e company plans to create a national network of TA Express stores. TA has adapted its facilities to meet the needs of professional drivers in areas that cannot accommodate a large format TA or Petro travel center, according to Barry Richards, CEO and president of TravelCenters. "New distribution centers countrywide have changed freight patterns and call for additional fueling locations not restricted to interstates and 25-acre parcels." Modern Tire Dealer asked if tires or tire-related services would be available at the TA Express locations. e company says truck maintenance services will be offered if suitable land is available. None of the first four TA Express locations offer truck maintenance services.